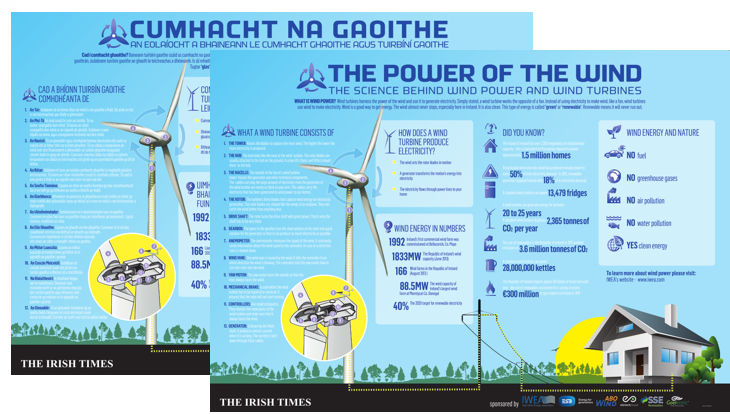 As part of Science Week 2013, IWEA joined up with the Irish Times to share with schools across the country a wall chart showing the Science Behind Wind Power and Wind Turbines. The wall chart is available both in English and in Irish and shows, what makes up a wind turbine, how a turbine works in converting the wind's power into electricity for our homes and workplaces, and shares some interesting facts about wind power in Ireland. Also take our "Classroom Power Quiz" to test your knowledge.